https://globaldevincubator.org/privacy-and-legal/ order now You may have read about the decline of the beloved monarch butterfly (Danaus plexippus) and most of you likely have heard of an effort to help the species by planting milkweed in residential gardens. Indeed, plants of the milkweed subfamily (Asclepiadoideae) are the only suitable hosts for the monarch, and urban sprawl has put a dent in the availability of these perennial jewels. viagra without prescription There is little said about the distinctive beauty of milkweed flowers. They are almost instantaneously recognizable for their unique and complex structure. As in our observation of the month of Hartweg’s climbing milkweed (Funastrum heterophyllum) by klyle161, found at bit.ly/2PagaJz, there is usually a circular cluster of several flowers (inflorescence) at the end of a stem. Each small bloom has petals (corolla), but the center of the flower looks intricate and very different from most garden blossoms. The anther and stigma are fused to form a round disk called gynostegium. That disk, in turn, is surrounded by five pitcher-shaped structures called “hoods,” from which a single appendage called a “horn” shoots out. In the climbing milkweed, the hoods are curved toward the center in such a way we can’t really see the horns. https://mysonginthenight.com/songwriting/ Planting milkweed in your yard can help the monarch population, but make sure to take a few factors into consideration before grabbing that shovel. Plant native species. Avoid tropical milkweed (Asclepias curassavica) which is carried by many nurseries since it is easy to grow. Yes, the butterflies might like this plant and the blooms are colorful, but tropical milkweed is invasive in Southern California and will naturalize around riparian areas. We now find it around Lake Murray. Tropical milkweed also has a different growth cycle than our native species and there is speculation among scientists that it may interfere with the monarch’s ability to migrate in a timely fashion. Narrowleaf milkweed (Asclepias fascicularis) is another native milkweed found in the park and would be a good alternative to tropical milkweed. 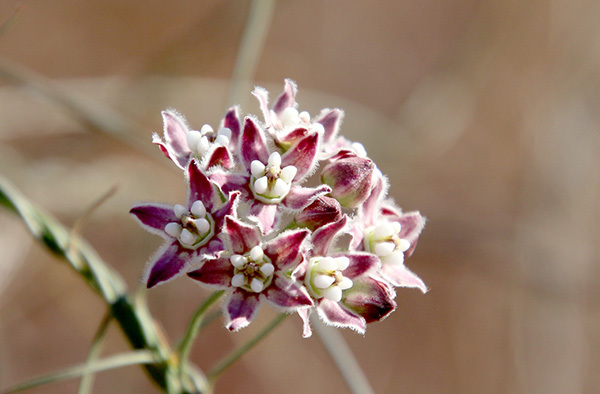 Check with your local nursery for availability of narrowleaf milkweed plants or be adventurous, order seeds online and start your own. Certain species can be toxic. If you have curious pets and you are unsure of the toxicity of the species you are using, plant your milkweed out of their reach. Finally, check out this video for identification and life cycle of common milkweed — please note that common milkweed (Asclepias syriaca) is not a native of San Diego county, but the blooms look very similar to our native species: bit.ly/2yOkUdG.